What was the first microwave oven like? When your tummy is rumbling, there's one kitchen appliance that can quickly stop the grumbling. From reheating leftover pizza to popping up some light and fluffy popcorn, there's one device that gets the job done in a jiffy. What are we talking about? The microwave oven, of course! You know the drill. You put your leftovers on a microwave-safe plate, pop it into the microwave, hit a few buttons, and like magic, it's warm and ready to eat. And all this takes place in a few seconds rather than the minutes or hours that the stove and oven can take. Who was the genius who invented this wonderful creation? As a matter of fact, his name was Percy Spencer and his invention was an accident! Spencer worked for a company named Raytheon, developing microwave radar transmitters during World War II. One day in 1945, he noticed that a candy bar he had in his pocket was starting to melt. The microwaves from the radar set he was working on were cooking the candy bar in his pocket! With a little experimentation, Spencer figured out that the microwaves could be concentrated to heat food. He created the first working microwave oven, and the first food he cooked in it was popcorn. Microwave ovens use microwaves, which are radio waves at a frequency of approximately 2,500 megahertz, to heat food. Microwaves are absorbed by water, fats and sugars and are immediately converted to heat. The microwaves penetrate food quickly, so they cook food evenly and quickly. Microwaves are not absorbed by most plastics, glass or ceramics, so they are perfect for heating food without heating everything else around the food. This enables microwave ovens to use less energy than other cooking appliances. Raytheon filed a patent for Spencer's microwave cooking process on October 8, 1945. 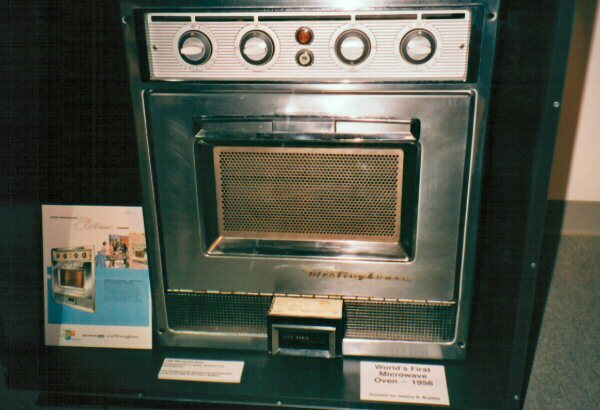 In 1947, Raytheon produced the first commercial microwave oven and called it the “Radarange." Would you believe it was almost six feet tall and weighed about 750 pounds? It's true! It was also expensive. The first Radarange was $5,000, which would be equal to over $52,000 today. It would be many years before microwave ovens could be produced and sold inexpensively. Today, millions of kitchens contain a microwave oven. You'll also find them in just about every restaurant kitchen and quite a few convenience stores, too. Whether you're heating up water for coffee, reheating leftovers for lunch or popping a bag of microwave popcorn for a late-night snack, the microwave oven does these things quicker than any other appliance. And that's why it's so popular! Tomorrow’s Wonder of the Day might really push your buttons! How common are microwave ovens today? Find out! Make a list of all the places you can find a microwave oven over the course of the next week. Is there one (or more than one) at school? What about where your parents work? Friends' houses? Convenience stores? Restaurants? Ask a friend to do the same thing and see who can find the most microwave ovens in one week. How much more quickly can a microwave oven cook a product than a conventional oven? Take a trip to the grocery store with an adult. Head to the frozen food aisle and find some example foods that can be cooked in either a microwave or conventional oven. Compare the cooking times for each method. Do the cooking times vary depending upon the type of food? Use a calculator to calculate examples of percentages for how much faster a microwave oven can be. Do you use a microwave oven in your kitchen at home? Here are some fun, easy recipes you can make with a microwave oven. Choose a recipe or two to try and then check the list of ingredients. You may need to make a trip to the store before you begin. Be sure to get help from a friend or family member! Heyy) I would like to know who is there the author. I need it for my task '' Is this website reliable to use and do they have author, can you contact them? ''. Hi, I was wondering who the author of this article is because I have to cite it for a paper. Where do I find the name of the author of this artical? Thanks! "Who Invented the Microwave Oven?" Wonderopolis. https://www.wonderopolis.org/wonder/who-invented-the-microwave-oven. Accessed 20 Feb. 2018. We ask that Wonderopolis be listed as the author, and since we do not list the publish date, you may put the date you accessed this page for information. Thanks for stopping by! "Who Invented the Microwave Oven?" Wonderopolis. https://www.wonderopolis.org/wonder/who-invented-the-microwave-oven. Accessed 11 Jan. 2018. This article piqued my interest in the latest products available on the market, and I found a great resource here: www.archiexpo.com/architecture-design-manufacturer/microwave-oven-110.html. Hope this is a useful resource for you other readers. So many great inventions were created by accident, did you know the telephone was created by accident too?! By the way, I was just studying microwaves and I saw this wonderful wonder. I am a big Harry potter fan,are you? Being a family member who promoted spencer, I actually married into the Spencer's. What would do without one? Wow! I never really thought about who invented the microwave! Wow I did not know that soap can do that in the microwave. I won't to try it in my house but with a different object maybe tofu. I loved how the soap [ivory] was melting and I can't believe the microwave oven was a mistake. This video was awesome I can't wait for tomorrow's wonder of the day. What will it be? Cool. This is awesome. I love microwaves. Everything on Wonderopolis that we read about that was invented always was a mistake invention. This article was so crazy. I can't believe microwave ovens were that expensive and big back then. It must have been really hard to use one. I think tomorrow's wonder is about riptides. Is the wonder for tomorrow about graves or cemeteries? What was in the microwave? It looked like a stick of butter, but butter would have melted, and the stuff in the video puffed up like an exploding storm cloud. Was it marshmallows? This is a great wonder!!! I never knew the microwave was invented by accident. Thanks for this great information today. We thought today's wonder was interesting because of how huge the first microwaves were. We think tomorrow's wonder will be about an avalanche, hoarders, spiderwebs, boulders, giant hamster balls, bulldozers, or some kind of machines. I wonder how different the first microwave oven was from the ones now? I wonder what will be next like it could be like where is the deeepest place on earth. Jaedyn thinks the most interesting thing we learned was that the first microwave oven was 6 feet tall! Shanaya wonders what materials Spencer used to build the first microwave oven. For tomorrow's Wonder, Kamron thinks it might be a car. Daevon thinks it might be a net. We can't wait to find out! Hi! Sorry I was busy. Friday! 1 What do you cook in your microwave? 2 Who invented the microwave? 3 What microwave do you have!? There are the questions! I thought today's wonder was really cool since Percy Spencer made it on accident. I think tomorrow's wonder will be a bed or giraffe. I thought today's wonder was cool because I never really thought about who invents what but now I do. I never knew that Percy Spencer invented the microwave on accident. I think tomorrow's wonder will be about hand over cliff or being buried alive. What was the first food cooked in a microwave oven? Which of the following is an example of a substance that absorbs microwaves?